Lamborghini India is all set to launch the 2019 Huracan Evo in the next few hours. The Italian exotic automobile manufacturer has made it more appealing with subtle tweaks in the design, aero package and also updates inside the cabin in the form of a touchscreen infotainment. 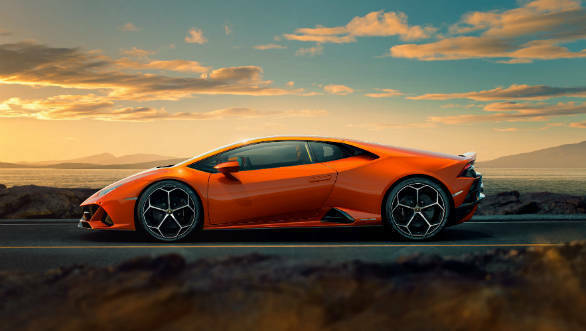 Most importantly, the 2019 Lamborghini Huracan Evo comes with the 5.2-litre from the Performante along with all-wheel drive, four-wheel steering. While the overall silhouette of the supercar remains unchanged, the 2019 Lamborghini Huracan Evo comes with a sportier bumper design wherein the y-motifs are evident. Inspired by the Lamborghini Countach - the cult classic of yesteryears, the bonnet gets interesting sculpting in the form of twin ridge lines. Inside, the cabin comes with a vertical 8.4-inch touchscreen infotainment system placed on the central tunnel. The 2019 Huracan Evo will be offered with a 5.2 litre naturally aspirated V10 sourced from the Huracan Performante. This engine puts out 640PS and 600Nm and can do 0 to 100kmph in 2.9seconds and from 0-200kmph in 9.0 seconds. Stay tuned to OVERDRIVE to get all the updates from the launch event in Delhi. The Lamborghini Huracan Evo is also a very connected supercar. Huge 8.4-inch multitouch touchscreen. Has all the usual plus the LDVI display. Telemetry is built in and you can download and upload to another Evo to compare/learn. The Lamborghini Huracan Evo design looks simple but the aero work is intense. The increase in downforce etc is HUGE. 700% more! 6 times for aero efficiency too! India chief Sharad Agarwal kicks off the proceedings saying that #Lamborghini now leads the super luxury segment in #India, not just supercars! The 5.7k slide is global sales. The other is Asia-Pac.